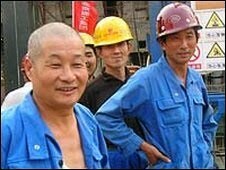 Chinese workers in Angola (BBC). ...In Portuguese-speaking Angola, which pumps two million barrels of oil a day, the two communities [Chinese and African] are even further apart. Meng Mei, born in France to Chinese parents, has been working in Luanda since 2008. "In my experience there is almost no contact between the locals and Chinese workers. There is no integration. On the construction sites, the Chinese usually live on site. They live, work and sleep there. They don't go out. It's quite similar to the way migrant workers behave in China. They save money and send it home. "For me, however, it is quite odd. I am Chinese but born and raised abroad. The Chinese workers do not go to movies or out to restaurants very much and they certainly don't do this with the locals. Some higher-ups may interact more, but only for business purposes," she says. The lack of strong ties between the communities has created distrust and resentment. There are long-simmering tensions over the number of Chinese workers brought over by firms doing unskilled jobs that could have been given to local laborers. The Angolan government has tightened its immigration policies, and the cost of winning a long-term visa for a Chinese worker, together with travel costs and welfare payments, has risen to as much as USD20,000. In response, Chinese companies have tried to take on more local staff, according to William Wang, an IT engineer who works with Meng Mei in Angola. “Back in 2008, maybe you would only see Chinese workers in Chinese companies but that has changed a lot in the last two years. I know a Chinese construction boss in Luanda, he hires 70 Chinese workers and 500 or 600 locals. It's not uncommon," he says. "I don't think the Angolans feel we are taking jobs. We have created employment also." Tessa's reporting suggests a few enduring conclusions: (1) Chinese companies respond to local conditions and incentives. (2) Analysts always need to keep in mind that the China-Africa relationship is evolving quickly. For more on these changes, see the August 20, 2010 Wall Street Journal article by Benoit Faucon and Sherry Wu: "Hostility Toward Workers Cools Angola-China Relationship." Just like you, I follow the China-Africa story closely. Thanks for the great work you're doing in this area. The WSJ has a blog titled "China Real Time Report" and their latest posting takes on this same China-Africa relationship, specifically in the area of transferring some of China's low cost manufacturing to Africa. I understand that Lucy Corkin has been doing a lot of work on Chinese business investment in Angola for at least the past year now. I can't wait to see what she has to say when on this topic once her research is done. I read an interesting series of articles in Forbes about a month ago about all the business opportunities in Africa, and how it was an untapped market just waiting to explode.I believe this article in the New York Times further illustrates that, along with pointing out all the new investment that China has been making all throughout the continent of Africa. One does wonder how that will ultimately benefit the Africans, but I do appreciate those articles and this one in showing that Africa isn't just some big negative; that there is a lot of positive to be done there.